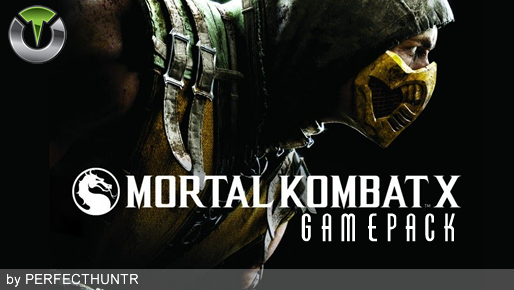 The Mortal Kombat X Gamepack for Titan One features all Character fatalities as well as an Auto Test Your Might mode. Fatalities are special finishing moves that can be used against one's opponent at the end of the final round. When the announcer says "Finish Him" or "Finish Her", the player can choose to kill him or her using a Fatality move. These fatalities require certain distances between the player and his or her opponent as well as quick button sequences in order to achieve the desired result. Every character has their own special Fatalities that must be performed at precise distances from the opponent. If input correctly, the background will darken and the Fatality will be performed. Additionally, Mortal Kombat X features a "Test Your Might" mode where you have to rapidly and repeatedly press all four move buttons on the controller to build up strength to break an object placed in front of your character. The Mortal Kombat X Gamepack allows the player to complete ALL of these challenges by simply holding 2 buttons down. You can configure up to 2 shortcuts to fast changing between your favorites Characters. Check the Gamepack Configuration section below to see how to configure each shortcut. Wait until the countdown begins and the game prompts you to build up strength. Press and Hold "Test Your Might Buttons" (configurable on programming Titan One, defaults to LS + RS / L3 + R3) until the circle on the screen turns green. Release those buttons to make your character complete the Test Your Might.